What is loyalty 2.0? What is the next loyalty paradigm? This isn’t mere hypothesis any more. There is action that is emerging now. 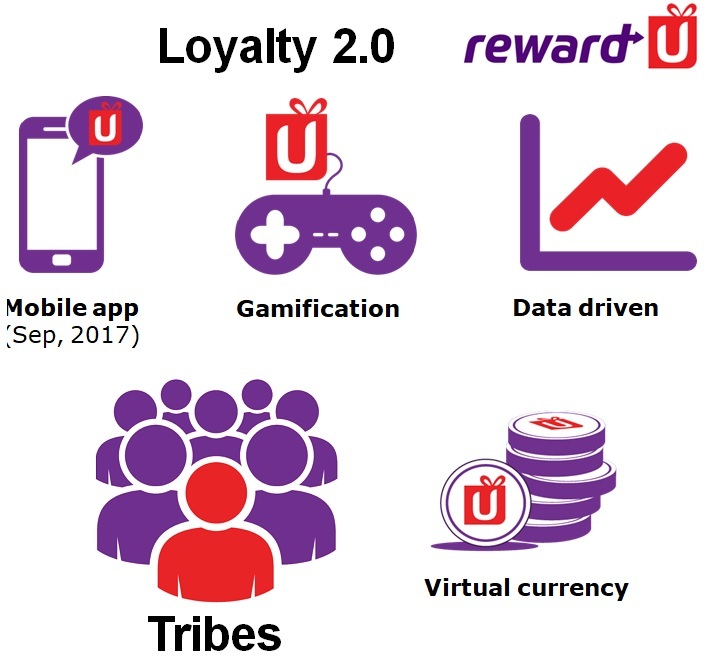 Consider the example of reward-U, a lifestyle and loyalty program being managed and operated by Hong Kong Express Airways. Launched in April last year, the program has over 1 million members, serving a growing segment of Millennials. The team asserts that there is a robust foundation in place now (based on dollars spent and not miles flown, few restrictions, any seat any time) with a “liquid currency” (rewarding everyday spending). There are other aspects that stand out even today. Take the case of reward-U Crew. Typically everyone in a family isn’t an expert or even interested in ascertaining how to make the most of a loyalty program or spending. But via the reward-U Crew feature, members can set up their own “crew” (maximum of 4 members, plus 1 Captain who ends up being the in the charge of all existing and future points and will decide how to use them). This not only encourages people to let their family or friends join or plan a trip together (since they are spending on non-travel items) but more importantly, it adds a “social” element that today’s consumers are so much used to. · Mobile app – an integral for any sort of activity, could be opening an account, customer service etc. The popularity of mobile-based loyalty programs is on the rise. According to study on loyalty in Asia by Nielsen last year, 69% of loyalty program members in Asia Pacific are more likely to participate in a loyalty program if a mobile app is available, compared to 56% globally. · Gamification – planning to bring lessons from the gaming industry to loyalty. The objective is to “gamify” events, activities etc. in order to stimulate the member activity within the program. The plan is to roll this out in the next 6-12 months. But gamification isn’t really new, yes today consumers’ have different ways of consuming content, it could be “emojis” for instance on messaging platforms. “Gamification is basically about incentives, everyone loves something “free”. So a user can ask someone to join the program and gains points for it. It could be for stimulating a certain activity, says surveys featuring members. Yes, it isn’t new but it helps in triggering repeat activity, getting them more involved. We find many people are open to incentivizing and enjoy that type of behavior,” mentioned Greenway. · Virtual Currency - high liquidity, minimal restrictions, increase earn / burn etc. · The concept of “Tribes” - based on overall activity, for instance, travel, retail, food etc. and a member can be in multiple tribes at any time base on a minimal level of activity. This is scheduled for Q1, 2018. “We believe that legacy tiers (as part of FFPs) tend to be one-dimensional. They are too linear base on “status” points etc. typically related only to flying. Tribes is about recognizing your everyday spending and everyday activity patterns. So if a user prefers to go out ,they could be a part of wining and dining tribe. Accordingly, there would be relevant content, plus incentives and promotions to step up the participation as per the user’s activity and the tribe they are part of. That way you have a home, there would be affinity with certain things. We are stimulating that affinity, that activity and one can be a member of multiple tribes – so sports, frequent travel etc. So it’s not one dimensional. This way we are going to leverage the program in a far more effective way,” explained Greenway, who added that the team has been analyzing data, encompassing one million-member base, and as a result has come up with the concept of tribes. Going forward, it’s not just about segmentation but also 1-to-1 personalisation. “Starting a loyalty program is always difficult considering that there is no data. But we are 16 months old now, we have been accumulating data, spending patterns etc. We are getting a picture of what people are doing. The association with a low-cost airlines doesn’t mean that our members are low spenders. They are high spenders. They might save money on airfares, but they can spend (relatively lot more) money on accommodation and so forth. Their retailing activities are not low-cost either, they are high-spend. They are bargain hungry but not averse to spending, too. “(The tribes initiative) is a direct result of spending pattern that the team has been observing in terms of consumption and activity,” he said. “And it is really about promoting that further.” So this means partners, too, get precise and actionable information about the behavior or preferences of the member base. “How reward-U and its partners will interact will depend on the dynamics within the Tribes themselves. We will overlay this approach with gamification to further incentivise engagement within a Tribe,” shared Greenway. So in this case there is 1st party data and 2nd party data about members that is available (according to Greenway, there are 25 partners and the pipeline of partners from airlines, dining, retail, transport, telecoms, travel & leisure exceeds 200; aiming to secure 50+ by the end of year). Organisations tend to struggle with such sources. So what’s Greenway’s recommendation as far as managing data and coming up with actionable information is concerned? “If you are just looking at data, then you aren’t really doing anything. (In our case), we take specific learnings and then we act on it, and then observe (what happens). The problem is everyone sees data and don’t really take action. We try to experiment from what we are seeing, try to stimulate activity or some type of behavior. Rather than accumulating data in huge amounts, we are taking snapshots and acting on it.